Yesterday, I spent a pleasant day down in Berkshire visiting the inaugural Ascot Spring Garden Show and also The Savill Garden. It was particularly interesting to me as I grew up near Ascot and Windsor, only moving to Malvern in 2000, so the day proved to be a real trip down memory lane. The show is the result of a partnership between Ascot Racecourse, The Savill Garden and The Valley Gardens at Windsor Great Park. 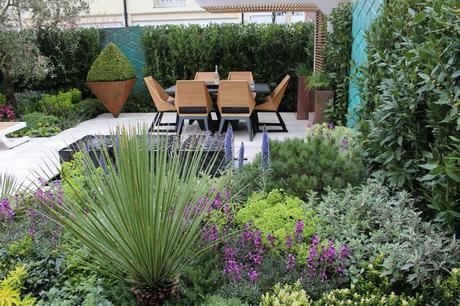 Unlike the vastness of Malvern Spring Show in about a month’s time, this is very much a boutique event with just the right mix of nurseries and show gardens. 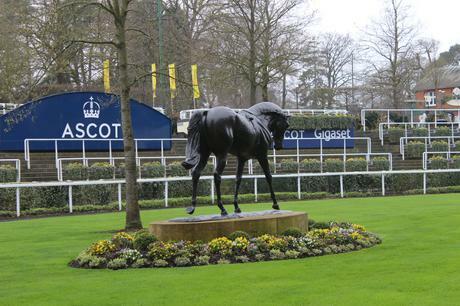 The event is held at Ascot Racecourse in the area adjacent to the Parade Ring with some nurseries and show gardens outside and some in the Grandstand. In addition to a Young Gardeners show garden competition, the show included six show gardens based on a “Town and Country theme”, They were all of a good standard and I have included some images from my three favourites on this post. What was particularly interesting was the amount of color that had been achieved especially as the gardening season has barely started. 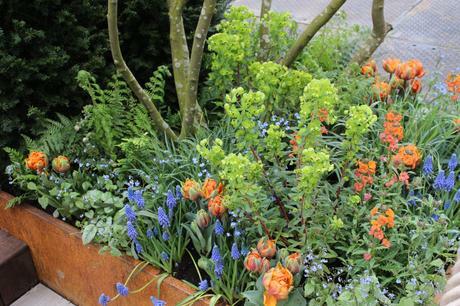 I like the planting in Kate Gould’s Garden. 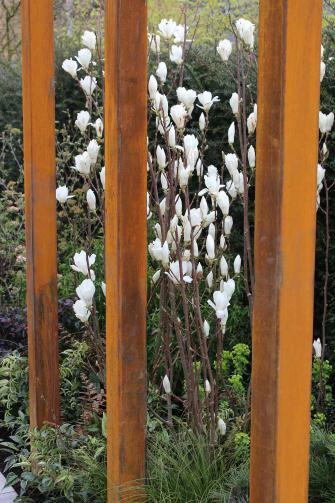 The Corten screening provided a wonderful back drop to the fresh spring flowers and foliage. I particularly liked the above combination. 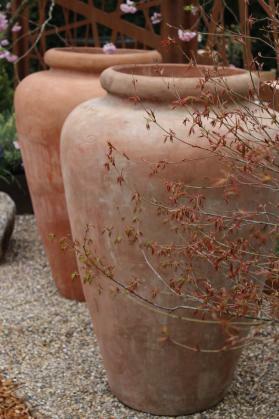 The clever placing of large pots gives interest before the new foliage appears. 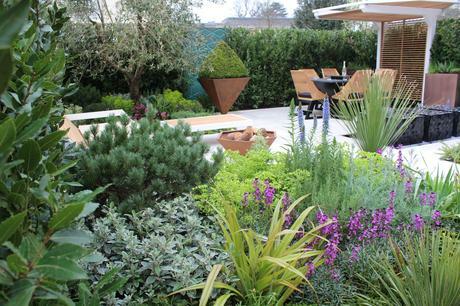 I really liked the almost understated planting in Joe Perkins ‘The Courtyard’ garden, again benefiting from the wonderful spring freshness of Euphorbia, I think this time it was Euphorbia martinii but elsewhere in the garden was my new fascination, Euphorbia characias ‘Black Pearl’. 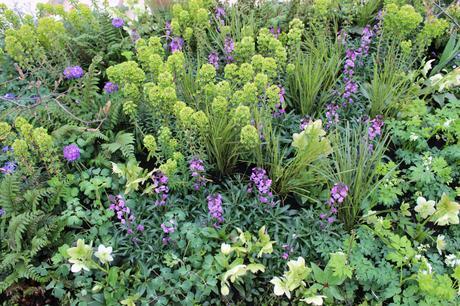 These have been under planted with drumstick primulas and Erysimum ‘Bowles Mauve’, ferns and what looks like young Dicentra leaves. I really must try Erysimum again. There were also around 30 nurseries and a whole host of trade stands but not so many that you found yourself looking for the plants which is the case these days at the bigger horticultural shows. 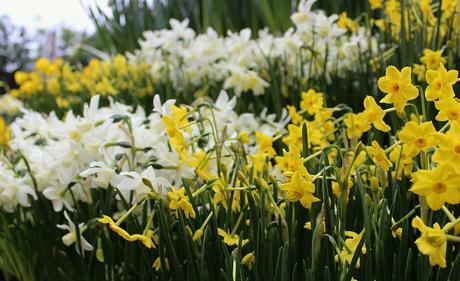 As you would expect at this time of year the bulb growers were out in force but also some nurseries that I rarely see at Malvern: Architectural Plants, Botanic Nursery Gardens, New Forest Hostas and Hemerocallis. 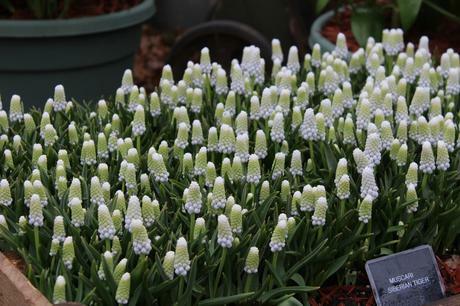 And I will leave you with my favorite plant from the nurseries, Muscari ‘Siberian Tiger’ and before you ask yes of course some came home with me, along with some Nerine bulbs for the Autumn. 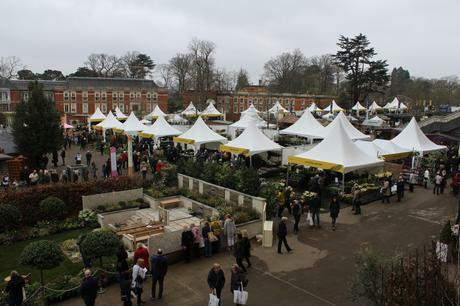 I thought the Ascot Spring Garden Show was really good, and that’s on a cold, damp and overcast day. As I said earlier it’s a small show, more somewhere to go for a couple of hours than the whole day and maybe combine with a visit to The Savill Garden as we did or a trip to Windsor. I do hope they repeat the show next year – I will certainly be hoping to go again.